Could the Warriors lose? It's not likely, but maybe. SI.com examines four ways the 73–win reigning champions could fall in the 2016 NBA playoffs. Get breaking news and SI’s biggest stories instantly. Download the new Sports Illustrated app (iOS or Android) and personalize your experience by following your favorite teams and SI writers. This story originally appeared in the April 18, 2016, issue of Sports Illustrated. To subscribe, click here. Could the 73–win Warriors lose in the playoffs and fail to repeat as NBA champions? Sure, it's possible. But likely? Not so much. With Golden State back in the postseason, SI.com's Lee Jenkins and Andrew Sharp examine how the Warriors could conceivably, possibly, maybe be beaten in the playoffs. For anyone tired of hearing that the Warriors are the greatest team ever assembled, that they have revolutionized basketball, that they have triggered a cultural phenomenon, that they're smarter than everybody else and more likeable and have so much more fun, then the Spurs are now your team. The Cavaliers, Clippers and Thunder all have a chance to topple Golden State, and record arguably the biggest upset in NBA history, but get real. The Spurs—Golden State's likely Western Conference finals opponent—are the only legitimate hope. The Warriors talk a lot about their rhythm, which they call their "flow," and for the past 10 months no one has been able to disrupt it. The Grizzlies did, in last year's West semifinals, and the Cavs did also, in the Finals. Since then the Dubs have dropped a game here and there, but their flow has continued unabated. ​The Warriors in general and Steph Curry in particular admit they feed off confidence. The confidence they earned from the championship last season led to more confidence from the streak that started this season which led to more confidence from their current six-month joyride. The team that beats them is the team that shakes them—the team that makes them feel fallible again. 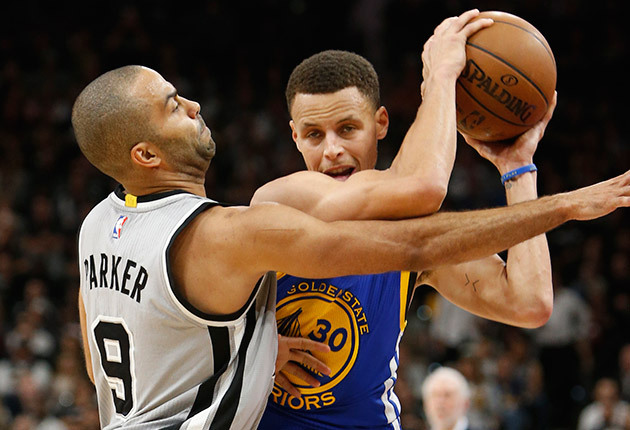 The Spurs cannot outgun the Warriors, but they can make them clank a few shots, if such a thing is possible. What Golden State has been to offense this season, San Antonio has been to defense. The Spurs have allowed just 92.9 points per game, almost three fewer than any other team. In the NBA good offense typically trumps good defense, which is why the Warriors would be favored in a series. But the Spurs' D can rattle anybody. So how would they do it? Downsizing, with Boris Diaw spending more time at center and Tim Duncan more time on the bench, as LaMarcus Aldridge punishes counterparts; switching pick-and-rolls, with Tony Parker and Danny Green hounding Curry and the bigs chasing him as well; Kawhi Leonard suffocating Klay Thompson. That was the recipe the Spurs employed in their second meeting with the Warriors, when they did what the Clippers, Thunder and Cavs could not: finish the damn game. Leonard has taken his star turn this season, morphing from stopper to centerpiece, but this series will test him. He can't fade into the background anymore, the way he did in the first round against the Clippers last spring, deferring to the bygone Big Three. He has to piggyback the Spurs, on offense as well as defense, delivering at both ends every night. No one expects him to match missiles with Curry, but he can put up a string of 25-point performances. He proved as much all winter. Many NBA players, plugged into their League Pass accounts, were demoralized by the Warriors. The Spurs, institutionally insulated from hysteria and immune to hype, kept grinding. They finished a tick below Golden State, and they couldn't care less if nobody noticed. While others were hand-wringing, they were searching for a way to beat the unbeatable team. If there's a formula, they're the best bet to find it. There have been cryptic tweets. There have been team meetings. A coach has been fired. There was an Instagram post by the franchise player posing as a morose cartoon Batman. There is uncertainty clouding the future in Cleveland, and angst in the present. But in the end, there is still LeBron. From a basketball standpoint, LeBron James remains a cheat code. He is the size of Bill Russell with a point guard's vision and the power of Karl Malone. He's averaging 25.5 points, 8.1 rebounds and 7.4 assists since the All-Star break. He is the only player in the NBA who can make Draymond Green's versatility look ordinary, and he outplayed Curry through most of last year's Finals. Yes, Golden State destroyed this Cleveland team in January, but I'm not sure a matchup this June would be so lopsided. Golden State will have to survive wars with two of the other teams on this list, and they'll have to stay healthy. The Cavs should have a much easier road. Whether they go big or small, Cleveland has more talent to throw at the Warriors than any team in the league. Tristan Thompson can punish them on the glass, and Kevin Love can chip in from the perimeter. Iman Shumpert is a capable foil for Klay Thompson. Kyrie Irving can do damage on offense, and his defensive shortcomings can be hidden on Harrison Barnes. J.R. Smith.... Well, he can't play any worse than he did last year. And while nobody is stopping Curry, Matthew Dellavedova is the most obnoxious defender this side of Chris Paul, so that's a start. 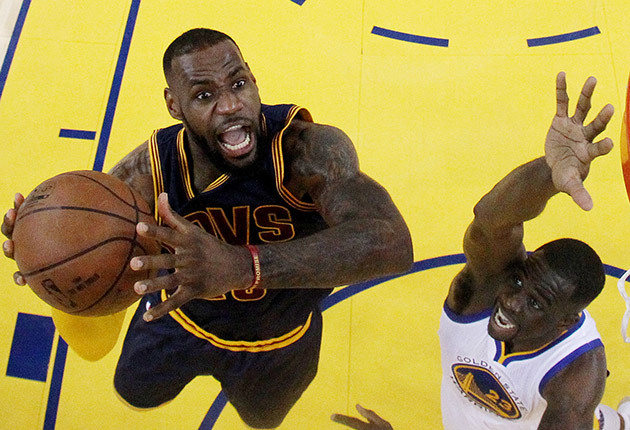 The Cavs can make these games ugly, and that's the first step to beating the Warriors. But mostly, this is about LeBron. Imagine how disgusted he must be reading this, a series of pieces whose premise is that any scenario in which the Warriors lose should be considered theoretical. So the ball is in the King's court now. Toward the end of last year's Finals, LeBron announced that he wasn't concerned. "I feel confident because I'm the best player in the world," he said after a loss. "It's that simple." At the time, it was that simple. Now nobody is so sure. Given the sudden rise of Curry, there's a real chance that LeBron will be known more for what he didn't win than the titles he did. There are plenty of people mocking and doubting him. It's not all that different from where he was in Miami once, when the Heat had lost to the Mavericks in the 2011 Finals and were roundly considered a failure. Back then, the basketball world wondered in hushed tones about LeBron's future—until he went off and dominated the Finals the following season. I don't know whether LeBron has it in him to do that against Golden State. He almost did last year, but the Warriors are a better team now. All I know is that LeBron has no better opportunity to cement his place in history than in a head-to-head matchup with Curry. And if the Warriors want to go down as the greatest team of all time, they'll have to go through a pissed-off superhero to do it. Among all NBA teams the Clippers have the best odds ... of embroiling the Warriors in a brawl before Game 1 that results in mass suspensions. The rivalry—almost certain to be rekindled in the second round—remains the most volatile in the league, and while it has mellowed a bit recently with Golden State's dominance and Blake Griffin's absence, Griffin is back and a playoff series will restore tension. If Griffin's quad injury limits him in any substantial way, the Clippers have no shot. But if he is at or near full strength, they have, well, a puncher's chance. The Clippers lost all four games with the Warriors this season, but they blew 10-point fourth-quarter leads in two of them. There are a couple ways to look at that. 1) The Clips can't finish the Dubs even when everything is going their way. 2) They are closer than you think. Within the L.A. locker room, players believe in their formula against Golden State: using DeAndre Jordan and Griffin at center in small-ball lineups, switching pick-and-rolls relentlessly and unleashing Jordan on Steph Curry when Chris Paul isn't hounding him. Two years ago the Clippers ousted the Warriors in the first round, and that was in the midst of the Donald Sterling fiasco. The principals haven't changed much, even if the outlook has. The Clippers need Griffin to heal, Paul to saddle Curry with foul trouble, J.J. Redick and Jamal Crawford to set arenas on fire with their shooting. And a Draymond Green suspension wouldn't hurt. Clippers coach Doc Rivers uses the term "emotional hijack" when players succumb to their anger. Usually he employs the phrase when discussing his own team. In this case the Clips have to aggravate the Warriors—which they've proven capable of doing. 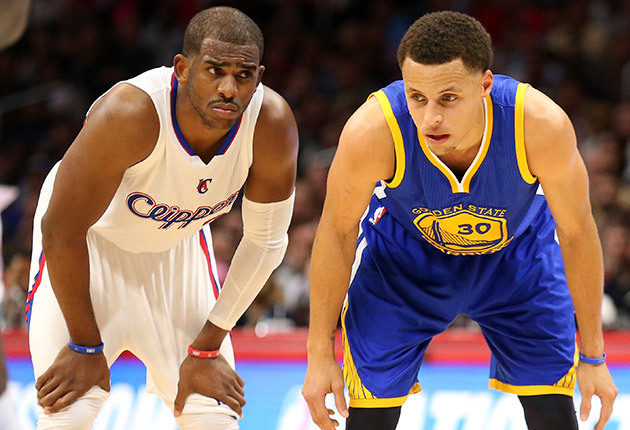 Let's assume the Warriors eventually vanquish the Clippers. They'd be on track to face the Spurs in a dream conference finals. But what if it's the Thunder, imbued with confidence from a second-round surprise? With Kevin Durant and Russell Westbrook, the Thunder can score with the Warriors. Their problem is slowing them. The OKC defense, while solid, is not elite. Like the Clippers, the Thunder can play small with Durant at the four, and they can switch pick-and-rolls, with Serge Ibaka hopping out on Curry. But Oklahoma City has also looked good with bigger lineups featuring Enes Kanter and Steven Adams. The Thunder are deeper than the Clippers and can tinker with formulas, tabbing Andre Roberson for his defense, Anthony Morrow for his shooting or Dion Waiters for a combination of both. But all those players carry risk. The Thunder will likely rely most on Roberson to blanket the perimeter, but he can't shoot reliably and the Warriors could give him the Tony Allen treatment, sagging off him and clogging the paint to impede Westbrook and Durant. In the end Russ and KD will have to simultaneously deliver the best series of their lives. They'll have to outshine Curry and Klay Thompson. They'll have to hit the clutch baskets that eluded the Thunder all season. They are still the best duo in the NBA, two of the top five players in the league. They won't be an easy out for anyone. Nobody needs Captain Obvious to come through and remind everyone that a Steph Curry injury could derail everything. But if we're surveying potential nightmares at the end of a dream season, let's be honest about this: Injuries are the biggest threat on the board. Well injuries, plus the very real possibility of a Joe Lacob Ted Talk on what Gregg Popovich can learn from venture capitalists. Also, we still don't know exactly what happened with Draymond Green in the Oklahoma City locker room back in February, but a mid-Finals meltdown would be less than ideal. For now, though, we'll focus on the most apparent catastrophes lurking out there for Golden State. This team is great for two reasons. First, Curry is one of the best players of all time. He may not officially be in that conversation yet, but he will be in a few years. And if the Warriors lose him, obviously, it's over. The other force driving this Golden State season is the best chemistry the NBA has ever seen. On defense almost everyone can switch and guard multiple positions. On offense the Warriors' passing overwhelms opponents and their shooting at every position makes them more or less unguardable. It all adds up to a lineup that nobody can stop. The flip side of that equation is interesting, though. The Golden State Warriors swept the Cleveland Cavaliers to win their third title in four years. The team got reversible rings with 74 sapphries on one side of the ring. The 74 represents the total number of victories the team earned during the regular season and playoffs in bringing home the franchise's sixth championship. The Warriors beat LeBron James and the Cleveland Cavaliers in the 2017 NBA Finals to win their second title in three years. NBA Finals MVP LeBron James and the Cavs defeated the defending champion Warriors in seven games for these rings featuring the Cavaliers’ “C” wrapped around the Larry O’Brien trophy. 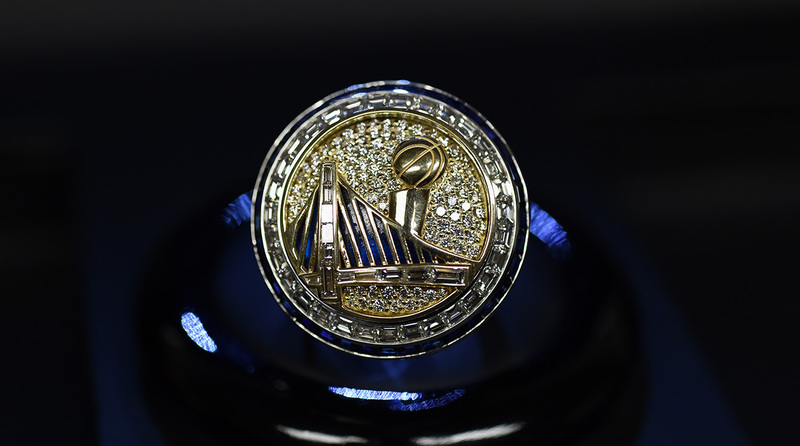 The Warriors took home these beauties after upending LeBron James and the Cavaliers in six games for their first title in 40 years. The Heat aimed to three-peat, but the Spurs had other ideas. Kawhi Leonard had a couple of breakout performances on his way to series MVP, and San Antonio ran away from Miami in five games. These rings would have never seen the light of day had Ray Allen not made one of the greatest shots in NBA Finals history. Thanks to Allen, the Heat rallied and defeated the Spurs in overtime in Game 6, and then won two days later to repeat as champs. LeBron James got his first ring as the Heat overwhelmed the Thunder in five games. James averaged 28.6 points, 10.2 rebounds and 7.4 assists. Dallas won three straight games to erase a 2-1 deficit and squash the newly formed Miami Big Three's title dreams. This was also the Mavericks' first NBA title in franchise history. The Celtics held a 3-2 lead in this series, but the Lakers took care of business at the Staples Center in Game 6 and 7 to repeat as champs. 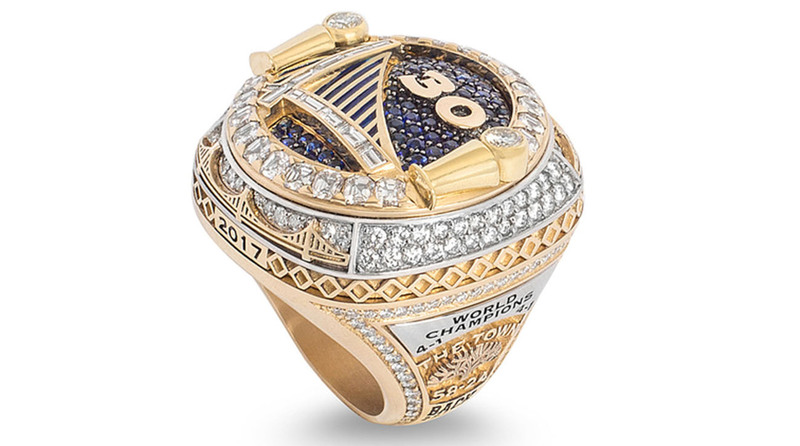 This was the fifth and final set of rings for Los Angeles with Kobe Bryant. The Lakers survived in a pair of overtime battles and then pulled away from the Magic in Game 5 to win their first NBA title since 2002's three-peat. Kobe Bryant won series MVP with averages of 32.4 points and 7.4 assists. Acquiring Kevin Garnett and Ray Allen during the off-season paid off quickly for Boston. In their first year, Garnett and Allen teamed up with Paul Pierce to defeat the Lakers in six games and bring the Celtics new jewelry for the first time since 1986. LeBron James' Cavaliers broke through to the finals, but they were no match for the Spurs, who completed the sweep for their third title in five years. In their first-ever NBA Finals appearance, the Heat became the third team in league history to win a championship after trailing 0-2. Dwayne Wade averaged 39.3 points in the next four games as Miami won the series in six. This series was almost as close as possible. The Spurs and the Pistons entered the fourth quarter of Game 7 tied, and Tim Duncan and Manu Ginobili led San Antonio in the fourth quarter to its third title under coach Greg Popovich. Larry Brown had an NCAA title ring, and a 4-1 victory over the Lakers gave the coach his first NBA championship ring. Brown remains the only coach to win an NCAA and NBA title. In one of the great all-time playoff performances, Tim Duncan fell barely shy of a quadruple double with 21 points, 20 rebounds, 10 assists and eight blocks in the series-clinching Game 6. The Nets did not put up much resistance as the Lakers completed a 4-0 sweep for their third straight title, giving coach Phil Jackson his ninth NBA title in 12 seasons. Allen Iverson carried the 76ers to a Eastern Conference title and Game 1 victory against the Lakers, but Kobe Bryant and Shaquille O'Neal were too much for The Answer. Los Angeles won the next four games, including three straight in Philadelphia, to win its second straight championship. In his return to coaching, Phil Jackson guided the Lakers to a 4-2 series victory against the Pacers, coached by Larry Bird. Shaquille O'Neal averaged 36.3 points and 12.3 rebounds, earning his first of three straight Finals MVPs. In a battle of dominant frontcourts, David Robinson and Tim Duncan bested Patrick Ewing and Larry Johnson as the Spurs defeated the Knicks in five games for their first NBA title. Michael Jordan's jump shot with 5.6 seconds remaining in Game 6 gave the Bulls their second three-peat of the decade. Since then, Chicago has no NBA Finals appearances and only one conference finals appearance. In a series featuring six Hall of Fame players, the Bulls defeated the Jazz in six games as Michael Jordan fought through food poisoning to lead Chicago to wins in Game 5 and Game 6. Dennis Rodman tied an NBA Finals record in Game 2 with 11 offensive rebounds against Seattle and then did it again in Game 6, the series clincher, but Michael Jordan was once again the no-brainer series MVP, averaging 27.3 points 5.3 rebounds and 4.2 assists. Hakeem Olajuwon taught young Shaquille O'Neal a few lessons in this series as the Rockets swept the Magic for their second consecutive NBA title. The Rockets were the first No. 6 seed to win a Finals series. The Rockets ended a five-season title drought for the Western Conference as Hakeem Olajuwon charged victories in Game 6 and Game 7 in Houston. The Bulls became the first team to three-peat since Bill Russell's Celtics in the 1960s. Chicago defeated Phoenix in six games, leaving Charles Barkley without a ring. Michael Jordan shrugged his way to a NBA Finals record six first-half three-pointers in Game of 1 of this series, and the Bulls went on to win in six games. The Bulls recorded their first-ever NBA title as Michael Jordan led the way averaging 31.2 points, 11.4 assists, 2.8 steals and 1.4 blocks to defeat the Showtime Lakers in five games. For the first time since 1979, the NBA Finals did not include at least one of the Celtics or the Lakers. The Bad Boy Pistons faced Clyde Drexler and the Trail Blazers, winning in five games for their second straight championship. The Lakers led entering the fourth quarter three times during this series but could never hold on as the Pistons swept them in four games. This time, the Lakers got the best of the Pistons in a thrilling seven games series where the final two games were decided by a combined four points. In a high-scoring series, the Lakers and the Celtics each broke the century in the first five games. Then Los Angeles held Boston to 93 points to win the series in Game 6. The Celtics captured their second title in three years, defeating the Rockets in six games. Larry Bird fell just shy of averaging a triple with 24 points, 9.7 rebounds and 9.5 assists. In a series that featured nine Hall of Fame players, the Lakers got revenge from one year earlier with a 4-2 victory against the Celtics. The Celtics came out on top in the first of three 1980s finals meetings with the Lakers. Larry Bird averaged 27.4 points and 14 rebounds, getting the best of Magic Johnson, who's Michigan State team got defeated Bird's Indiana State squad in the 1979 NCAA championship. In a rematch of the 1982 finals, Moses Malone tore up the Lakers front line for 25.8 points and 18 rebounds per game as Philadelphia swept Los Angeles. There are other potential risks too. Andrew Bogut is on the wrong side of 30, and he's a perpetual injury candidate. (He hasn't played more than 70 games in a season since 2007—08, when he was 23.) His backup, Festus Ezeli, only recently came back to the court after missing 31 games with a knee injury. 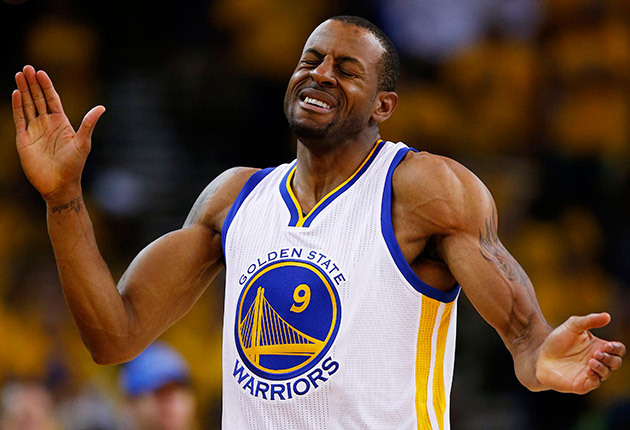 Barnes sprained an ankle in November, and he was out until January. None of the injuries derailed Golden State during the regular season, so maybe it won't matter in the playoffs. In fact, it probably won't. Curry is still good enough to elevate Golden State past anyone. Whatever happens, I will not go on record doubting the Warriors in 2016. If you'll remember, though, that the most vulnerable this team looked came during the beginning of the NBA Finals last year, when Green was battling mysterious back issues. We may never know what was wrong. All that's certain is that Green stopped shooting, trapping Curry started working and for a few games there, the Warriors' offense froze. It worked out in the end for the Dubs—but only when Green's back loosened up and Kerr inserted a healthy Iguodala into the starting lineup. What happens if they don't have those luxuries this year?